Sweet potatoes come in two general forms: vegetable varieties bred for their edible roots, and as varieties bred specifically for their ornamental trailing foliage. Both types belong to the Ipomoea batata species, a tender perennial normally grown as an annual, and both ornamental and edible varieties are quite easy to grow in pots. While both varieties are technically edible, those sold as ornamental sweet potato vine are sometimes described as "barely edible" since the roots are smaller and much less sweet (bordering on bitter); these have been bred primarily for their attractive trailing foliage. Sweet potatoes bred as edible vegetables have much larger, sweeter tuberous roots, and their foliage is less attractive. Both edible and ornamental varieties of sweet potato grow quite well in large pots. Both types grow best in sunny conditions, but if you want to grow the garden varieties that produce edible tubers, it will take quite a long growing season. It takes 100 to 140 days for sweet potatoes to grow harvestable tubers, depending on the variety. In some parts of the country, that means that propagating your own plants will need to start about 6 to 12 weeks before the last frost date. Both types of sweet potato are widely available for sale as small container plants in the spring, but they are also easy to grow yourself by sprouting "slips" from pieces of the tubers, which is the method described here. If you want to grow edible varieties, simply buying some sweet potatoes at the grocery store is fine. Organic produce may be more likely to sprout, since some conventionally grown sweet potatoes have been sprayed to retard sprouting. If you have saved tubers from ornamental sweet potatoes, these will work fine for propagation. Or you may be able to find ornamental sweet potatoes sold as indoor plants that can be used for propagation as many new plants as you want. Large sweet potato tubers may need to be cut into large pieces in order to place them in water for sprouting. Use a sharp knife to cut the tubers into pieces just slightly smaller than the opening on the jar or glass. Locate the middle of each tuber piece and insert three or more toothpicks into it; they should go about 1/2 to 1 inch into the tuber. Space the toothpicks evenly around the circumference of the tuber. 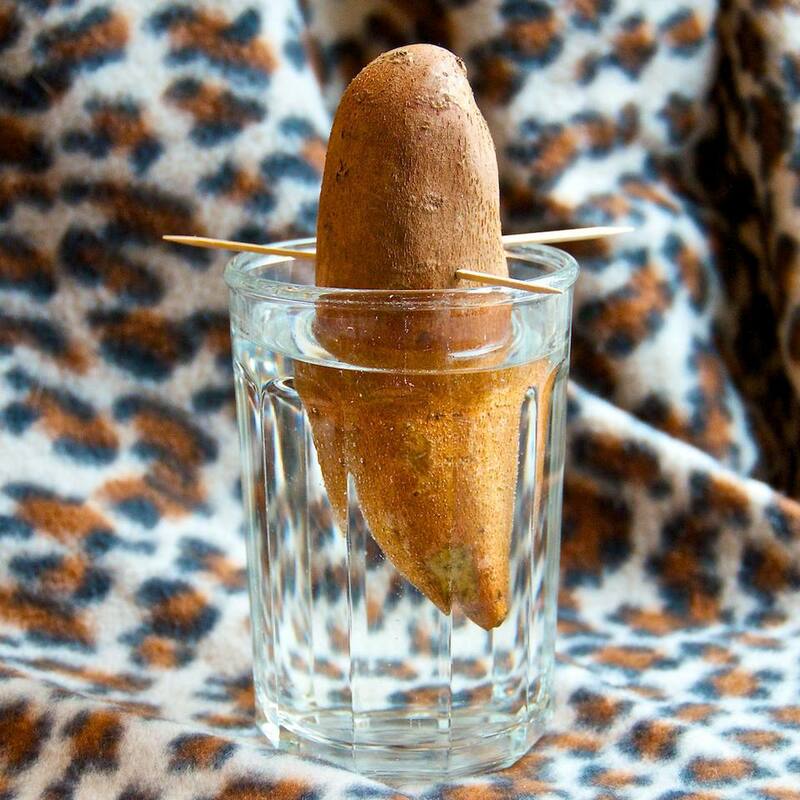 If the tuber is too hard, you can drive a small hole with a thin nail, then stick the toothpick into it. The next step is to place the tuber in water to sprout. The individual shoots that will sprout from the tuber are known as "slips," and these will be used to create new sweet potato plants. Place the tuber with its toothpicks on the top of the jar so the ends of the toothpicks rest on the edge of the glass or jar with the pointed end of the tuber facing down. Fill the jar or glass with enough water to cover the bottom half of the tuber. Put the container on a sunny windowsill, and change the water every couple of days. Make sure to keep the bottom of the tuber submerged in water. It may take a few weeks or even a month before you see green growth sprouting from the top of the tuber. Tip: If your tap water is heavy with chlorine and other additives, it may prevent the tuber from sprouting. If the tubers are not sprouting, replace the tap water with distilled water. Once the sweet potato tuber has sprouted, your next step is to separate the sprouts into individual "slips" that can be planted. Take each sprout and very carefully separate it from the tuber by gently twisting it. There may already be a rudimentary root structure attached to the slip. Lay each slip into a shallow bowl with the bottom of the stem submerged in water and the leaves hanging over the edge of the bowl. New roots will begin growing from the bottom of the slip within a few days. When the new roots are about 1 inch long, the slips can be planted in potting soil. But make sure discard any slip that is wilting or that hasn't produced any roots; these won't be viable. If you want to grow your sweet potato vines as decorative plants, find a small 3- or 4-inch seedling pot with good drainage. Once these plants have begun to grow robustly indoors, they will be ready to transfer to large mixed containers with other plants. If you are growing edible tubers as vegetables, you'll need a large container or bucket to allow them adequate room to grow. Or, if you will plant the edible sweet potatoes in the ground, then the slips can be started in seedling pots, also. Fill the container with high-quality potting soil until the surface of the soil reaches about 1 inch below the rim. The tubers need loose soil to grow large. Mix a slow-release fertilizer into your potting soil so that the fertilizer reaches the bottom of the pot. Make a hole in the center of the soil, deep enough to cover the roots of the slip. Then gently put one or two slips into the hole and pat the soil firm around them. Make sure that there are no air pockets near the roots. Water thoroughly. After watering, you may find that the soil has settled; if so, add more soil to the pot. Put your pot in a sunny indoor spot and keep the soil moist, but not wet. To test moisture levels, stick your finger into the soil up to the second knuckle. If the soil feels dry, add water. If it's moist at your fingertip, wait a day or two. Your plant may grow very quickly. Depending on the size of the container, you may have to pot again or prune the roots if the plant becomes root-bound within the pot. Sweet potatoes like warm weather, so make sure all danger of frost has passed before you put your new plants outside. It also helps to harden off the new plants by acclimating them gradually to the outdoors before putting them into their permanent locations. Whether you are planting your edible sweet potatoes in the ground or ornamental sweet potatoes in large mixed pots outdoors, wait until the outdoor soil is at least 60 degrees Fahrenheit (this occurs when air temperatures have been 65 degrees for quite some time). This could be as long as a month after your last frost date. Loose soil is the key to getting good edible tubers, so take some time to prepare the planting site if your plants will be growing in the ground. You can harvest vegetable varieties of sweet potatoes at any stage and they will be edible. Depending on the variety, though, it will usually take 100 to 140 days for them to fully mature. In any case, they should be harvested before the first frost in the fall for best edibility. To get the most flavor from your sweet potatoes and to extend their shelf life, cure them in a warm, dry place for 10 days to two weeks before eating.